A winning shot at International Fine Art Photography Award in the landscape category, by Polish artist, Marcin Ruchek. Taken as a snap. Love it. 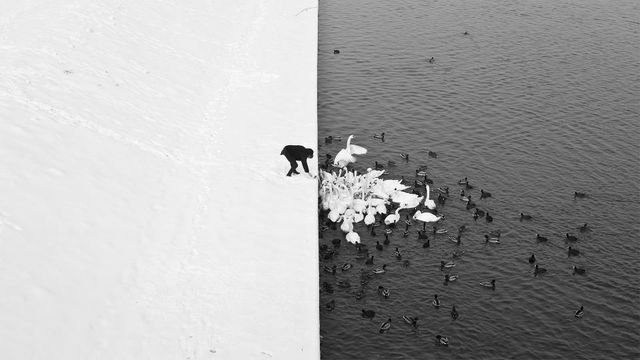 A Man Feeding Swans in the Snow - Photograph was taken in Cracow from Grunwald Bridge. Contrast created by a nature of white snow and dark water separated by a line equal to the waterfront is a graphical reflection of the Yin-Yang symbol - opposing but complementary forces. The dark silhouette of a man on a light background and white swans on the dark water, surrounded by a ring of black ducks, compose complementation of the image, thereby giving it many possibilities of interpretation.